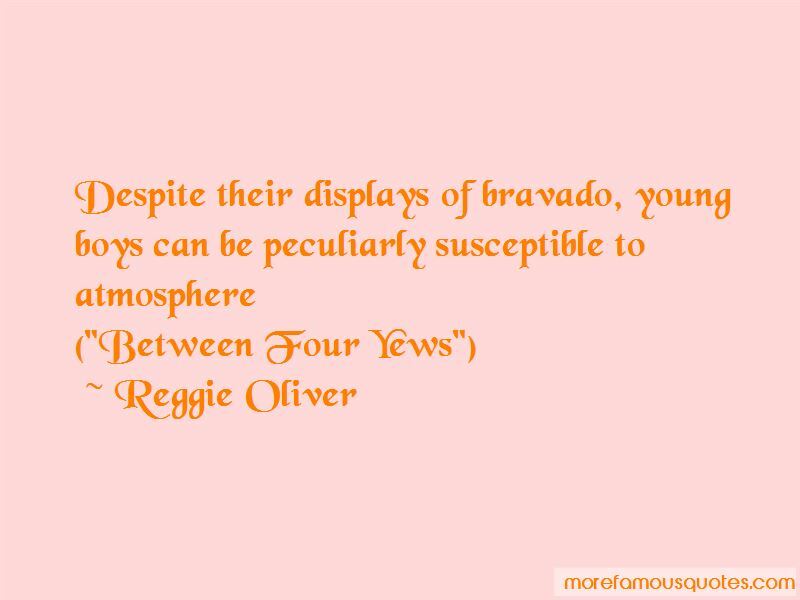 Enjoy the top 4 famous quotes, sayings and quotations by Reggie Oliver. “The celebrations go on for many hours, said the woman. Above her, in the sky, a firework exploded, showering multi-coloured flames across the stars. You can pay fealty at any time. Another firework tore open the sky, streams of colour painting the womans shift blue and green, throwing their shadows downwards. For a moment, the womans shadow self moved against the shadow Fillingham, pressing to him, and then another explosion above them sent them dancing apart, wavering, their edges rimed with yellow and reds, and then the woman was moving again. Hillingham first saw the women by the dwile flonkers. He had spent the day walking around Dover's Hill, the shallow amphitheatre where the Cotswold Olimpick Games took place and had taken, he thought, some good photographs so far. The place was heaving and he had captured some of that, he hoped; the shifting bustle as people flocked from event to event and laughed and shouted and ate and drank. The sound of cymbals and mandolins and violins and guitars filled the air about the crowd, leaping around the brightly costumed figures and the smells of roasting meat and open fires. “The celebrations go on for many hours,' said the woman. Above her, in the sky, a firework exploded, showering multi-coloured flames across the stars. 'You can pay fealty at any time.' 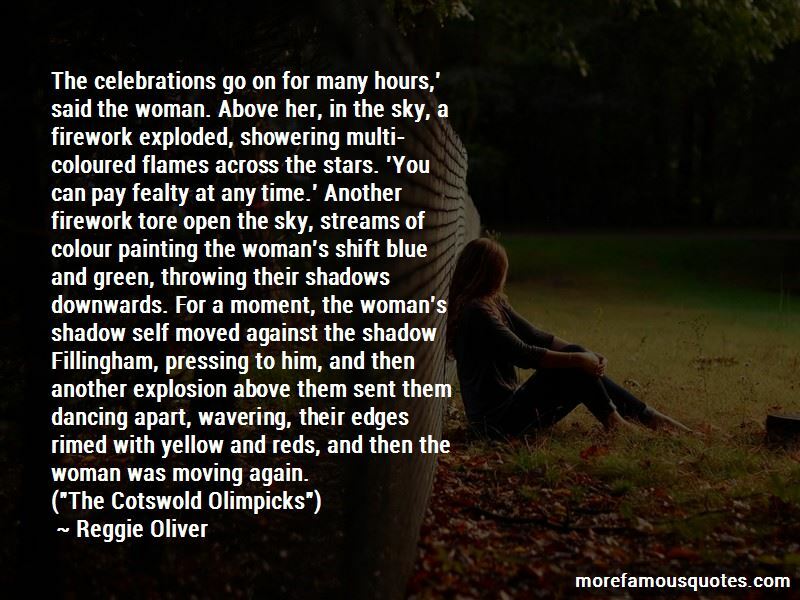 Another firework tore open the sky, streams of colour painting the woman's shift blue and green, throwing their shadows downwards. For a moment, the woman's shadow self moved against the shadow Fillingham, pressing to him, and then another explosion above them sent them dancing apart, wavering, their edges rimed with yellow and reds, and then the woman was moving again. 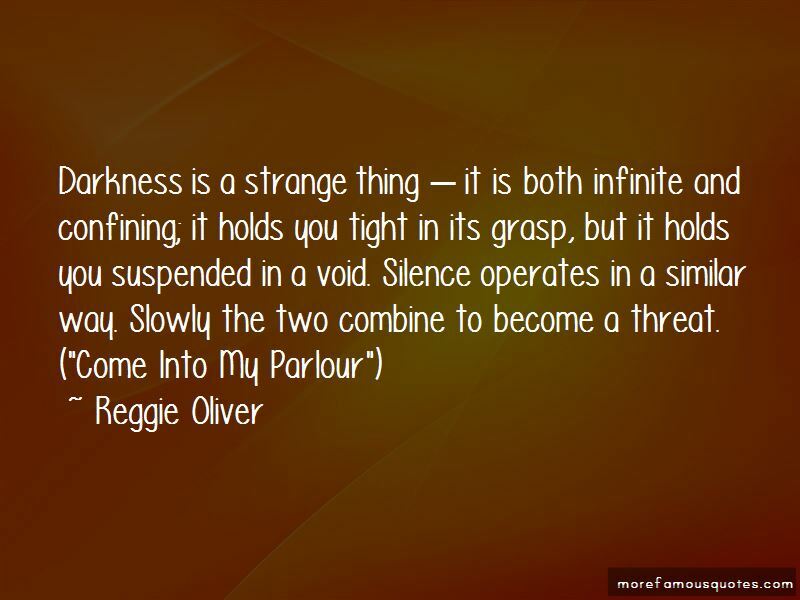 “Darkness is a strange thing - it is both infinite and confining; it holds you tight in its grasp, but it holds you suspended in a void. Silence operates in a similar way. Slowly the two combine to become a threat. Want to see more pictures of Reggie Oliver quotes? 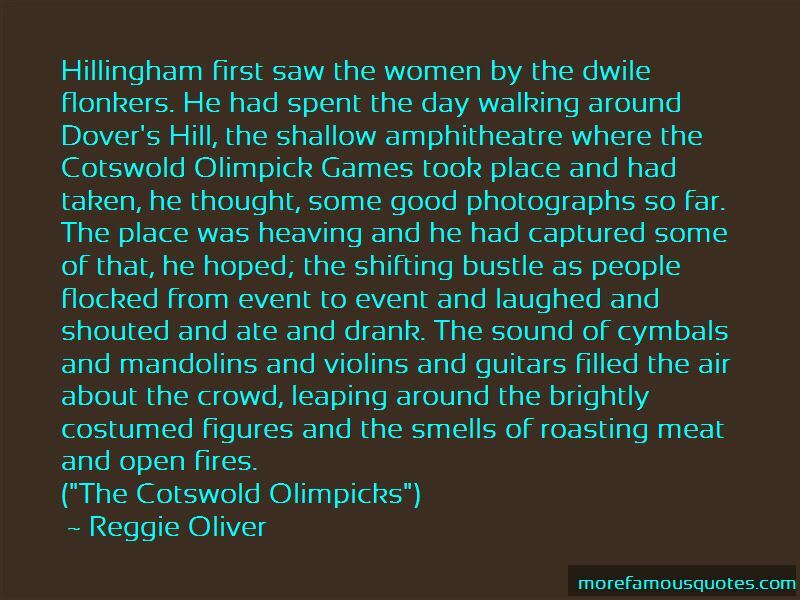 Click on image of Reggie Oliver quotes to view full size.